Ttrobotix Super Hornet X650 Kit: Ttrobotix Air Supremacy! Home » Product Reviews » Ttrobotix Super Hornet X650 Kit: Ttrobotix Air Supremacy! Thunder Tiger is an RC electronics manufacturer that was established over 30 years ago and has become a global RC brand. 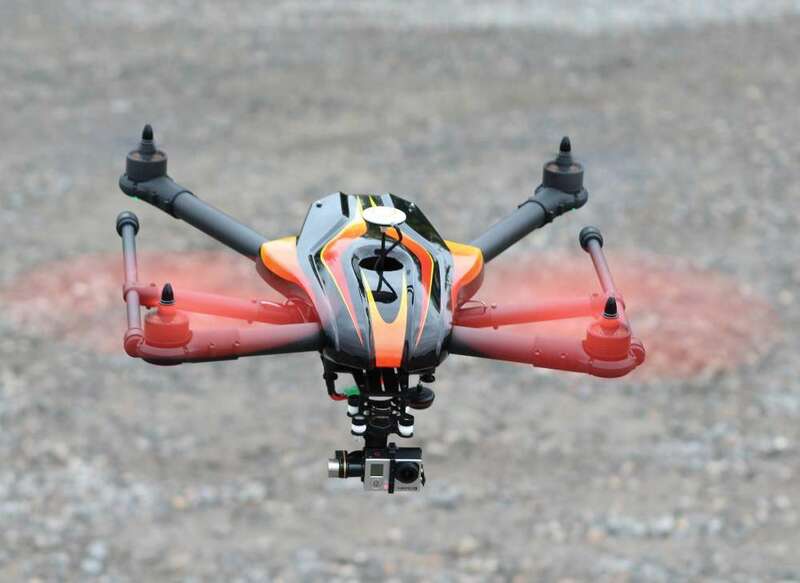 Just like most of the other RC manufacturers, they decided to jump on the multi-rotor bandwagon under the TTRobotix brand and introduced a few models to cater to both sides of the rapidly growing “drone” market. While their Ghost and Cobra quadcopters are ready-to-fly, “everything included” machines aimed at the customers who may not posess the will or skill to build their own multi-rotor, the TTRobotix Super Hornet is a kit for people who prefer to build their own machines and do some serious work with them. The kit arrived in a nice box with all the parts packaged in logical groups. It includes all you need to build the frame and power it (motors and ESCs). I chose a DJI Naza-V2 flight controller, Futaba 14SG transmitter with Futaba R617FS 7 channel FASST receiver. DJI Naza will work with both traditional and Futaba S.bus receivers. A spare channel on the receiver is needed to control the retractable landing gear. All the CF and plastic parts were defect free and good quality. The included manual is fairly well executed. The drawings are easy to understand and the manufacturer included a separate sheet depicting the power and signal distribution board layout. Included in the package is also XT60 battery connector that solders right into the board. If you’re using another battery connector, add one to the list of needed parts. Building the Super Hornet is not terribly complicated and any intermediate RC builder should have no problem with it. The build begins by mounting the motors to the top half and included LEDs to the bott om half of the motor mounts. I then connected the ESCs to the motors. The ESC wires are color coded. If the color coding is followed when plugging the motor leads in, the motors spin counterclockwise, so my recommendation is to swap two of the leads for the motors that will be spinning clockwise. This will save a partial disassembly later since the ESCs are hidden inside the tubes. I braided the ESC wires to lose some length and then fed the ESC and LED leads through the arm carbon fiber tubes. The 340Kv motors are nicely machined with large bearings and come with prop adapters. The top and bottom halves of the motor mounts can then be put together at the end of the arm and secured with seven screws and lock nuts. The mount halves have knobs on the inside that align with pre-drilled holes in the arms, which helps to ensure that the motor mount is level and can not twist out of alignment mid-flight. As as this solution is, I’ve found it missing on many other kits and always had to come up with a solution to secure these in place on my own. The side of the arms between the center plates gets a plastic wedge inside of it with two holes that line up with the pre-drilled holes in the arm’s CF tube. The bolts retaining the arms in-between the plates will eventually go through these holes and the wedge helps stabilize the arm, protects it from being crushed and also protects the ESC and LED wires from being rubbed through by the arm retaining bolts. With the arms completed, I soldered the servo connector headers in place for the motor and gear connections to the main board. Depending on the flight controller you will use, you have to choose whether to solder the ESC signal wire headers to the front of or behind the flight controller. Since I’m using a Naza V2, I soldered them forward from the flight controller location to keep the connecting wires short. I secured the header in place by taping it on the connector side, soldering the pins to the appropriate pads and testing for any bad connections with my multi-meter. I also soldered the main power lead pigtail to the power pads and used the extra available pads on the board to solder on three more pigtails with connectors for my flight controller and peripherals (gimbal, video transmitter). I then mounted the spacers (that will eventually hold the top and bottom plates together) to the bottom plate, flipped the plate over and mounted the battery/gimbal plate. The battery plate is spaced out by rubber stand-off s to create a clean unit that helps prevent the transfer of any motor induced vibrations to the gimbal and camera. Next, I moved on to the retractable landing gear. The gear servos seem pretty solid and have very little slack in them. The CF tubes get mounted together by a machined aluminum T-connector and the kit also includes rubber stops for the ends of the skids. The gear is mounted to the bottom plate using a wedge-shaped plastic insert that takes care of the gear off set (the servos are 90 degrees and this wedge is used to angle the gear outward by about 10 degrees). With the gear and battery plate in place, I attached the arms to the bottom plate using the supplied bolts and secured them loosely in place with the thumb nuts. I then soldered the ESC leads and LED wires to the appropriate pads, making sure I left enough slack in the wires so they’re not being pulled on in either folded or unfolded arm positions. I plugged the ESC signal wires and landing gear leads into appropriate headers on the board and moved on to installing my flight controller. There is a predetermined position for the flight controller outlined on the bottom plate. I cleaned the surfaces with an alcohol wipe and used some 3M heavy duty dual sided tape to attach the flight controller firmly to the plate. The Naza PMU (power management unit) sits neatly next to the flight controller and plugs into a power lead I prepared for it earlier. I chose a 7-channel FASST Futaba receiver (R617FS) and followed the diagram in NAZA manual when connecting the receiver to the fl ight controller. To take advantage of the retractable landing gear, one channel needs to be connected to the landing gear header(s). There are two headers for the landing gear connection – one for the signal wire/ground and one for power. This is done to leave the builder an option to use a 5V BEC to power the landing gear. Since the receiver is perfectly capable of supplying 5V to the gear servos, I simply used a hobby knife to pull the signal wire out of the connector and slipped it in it’s own connector, de-facto splitting the receiver wire into two parts (power and signal) to accommodate the two separate headers. If using a 7-channel S.bus receiver, you can take advantage of the Naza S.bus compatibility and still plug your retracts into one of the available channels (the “traditional” connections on the receiver still work and they mirror the S.bus channels, so make sure you choose a channel that is not already used by your flight controller). I then connected the Naza LED module and mounted it to the underside of the copter. There is a designated place on the top plate to accommodate a standard GPS mast and secure it with screws in the predrilled holes. After making sure that everything worked correctly, I attached the top center plate to the frame. This gets done by screwing it onto the center plate spacers and securing the arm bolts in place. Each arm gets two bolts, one that the foldable arm pivots around and one that is secured by a thumb screw and travels in center plate channels when folding and unfolding the copter. To secure the arms in place in fully folded or unfolded positions, the thumb nuts are tightened and sink into larger holes on either side of the channels the bolts travel in. These holes are only in the top plate channel, which left me wishing that the designers would consider leaving them in the bottom plates instead. Placing the thumb nuts on the bottom of the copter would make them easier to access without having to remove the canopy every time I need to fold/unfold the arms. There is also an option to attach the GPS/ compass module to a round indent in the canopy; however, I am not the biggest fan of this solution since this leaves the GPS/compass too close to the other electronics and also makes it difficult to remove the canopy when accessing the thumb nuts securing the foldable arms. Using a rotary tool, I cut an opening in the canopy to clear the GPS module and mast and used a black permanent maker to mask the white edges of this opening. I turned the GPS/compass module counter-clockwise by 14 degrees to account for the magnetic compass declination to make sure that the aircraft flies straight and does not display a “toilet bowl” effect. Once everything checked out, I used the included prop adapters to attach the 1447 plastic props. The props have a standard round hub with plastic spacers. My only wish was for the prop nuts to have a serrated flange to lock-in the props a little better. 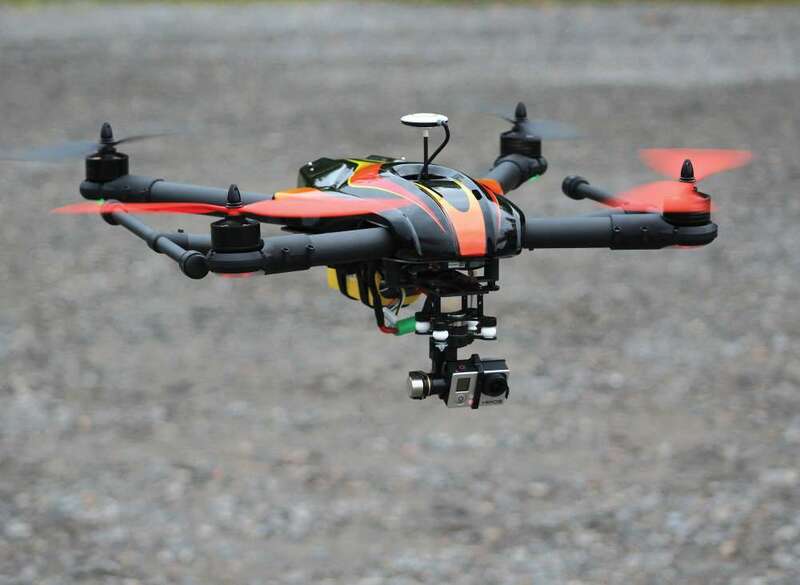 As a precaution, I do not install any video equipment or peripherals until after the maiden flight in order to minimize any possible damage if something goes wrong during the maiden. The maiden flight went as expected, the copter was very responsive and thanks to its size, easy to control and resilient in windy conditions. I flew the Super Hornet for three battery packs and then moved onto installing the gimbal, OSD (on-screen display) and video transmitter. Since I chose the DJI Naza V2 flight controller, I chose to complement it with Zenmuse H3-3D 3-axis brushless gimbal with GoPro Hero3 Black camera. I mounted the gimbal to the front of the battery plate using 1 inch spacers to lower it a bit below the plate. I had to drill a couple of holes in the plate to allow for the gimbal installation. I added DJI’s mini-OSD to get a real time read on the vital flight information on my video monitor. I also installed Immersion’s 600mW 5.8Ghz video transmitter. I plugged the video transmitter and the gimbal to the connectors I previously soldered onto the power distribution board and used dual sided tape to install the OSD unit, video transmitter and the gimbal control unit (GCU) in the space between the bottom and battery plates. I used a 90-degree SMA adapter to attach the antenna to the video transmitter to have the antenna facing down. After verifying that everything works, I tucked in the wires, and went to test fl y the unit again. I used a 5500mAh 6S LiPo battery and got 15 minute flight time with the above mentioned video gear. The copter performed very well, without and vibration induced “jello effect” in the video thanks to the dampeners used to hold the clean plate. The shorter front arm design and retractable landing gear have helped to keep the props and the gear out of camera’s view even during more spirited flying. Speaking of which, the Super Hornet can actually get up and go at a pretty brisk pace. I prefer to fl y in manual mode unless I’m working a job around structures and people and this machine flies like a dream. The big 340Kv motors have decent vertical performance and always ran nice and cool, even on warmer days. The retractable landing gear worked fl awlessly throughout our testing and it was nice to be able to capture some great aerial footage without the worry of the gear popping into frame. Not only that, but the Super Hornet looks much more aggressive with the gear up. The large airframe seems to be very stable, even in windy conditions so when it’s set up properly, it could make quite the camera rig for hobbyists or even professionals. The larger size gives it greater payload capacity so there are loads of different camera/ gimbal combinations that could be used. Also, the lower deck of the main frame is plentiful with space to mount any peripheral electronics of your choice. I’ve already got a couple dozen flights on this copter and I like it more and more every time I fly it. Using the Naza V2 seems to be the winning ticket and while I’m sure there are other viable options out there for flight controllers, you really can’t go wrong with this combo. The TTRobotix Super Hornet is a great copter for anyone who prefers to build their own drones. The kit is well designed, uses good quality materials, comes with easy to understand instructions and provides the builder with a lot of flexibility to install different camera equipment and other accessories. This 650mm sized copter is fun to fly, large enough to be resilient in the wind and folds neatly for easy transport. Attach whatever camera gear you like and you’ve got a stellar combo for aerial photography and videography. If you’re in the market for a larger machine, give the Super Hornet a good hard look. It’s a sweet machine.